Bean Facts, an information sheet for kids cooking activities. Bean facts and general information about Beans. 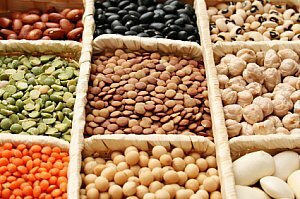 Beans are rich in nutrients, low in calories and a good source of protein, vitamins, minerals and fiber. Kidney, black, great northern beans (white), lima. 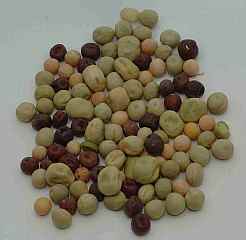 Legumes are also included in beans such as lentils, peas, chickpeas, mung, and soybeans. Canned beans are ready to use. To cook, cover with water and simmer one hour or until tender. To add flavor that the beans can soak up while cooking, add onion, carrots, ham bones and a bay leaf to the water. 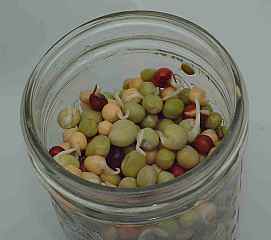 If your kids dont like cooked beans try sprouting your own beans. They come out with a much different taste and you may find a new way to get your kids to snack on something healthy. Lentils, adzuki, mung, garbanzo are all good ones to try. Beans need to be fresh and not canned and not already cooked. They should be hard and fresh when starting the sprouting process. Add beans to a glass jar and pour cool water in the jar. The water level should be several inches above the beans. Secure a lid with a mesh top or cheesecloth. Let sit overnight. Drain beans and rinse several times. Make sure you shake all the excess water out. Place on your kitchen counter or somewhere away from direct sunlight. It doesn't have to be dark but it needs to be open to air. Every night and morning for several days continue rinsing with cool water and shaking all excess water out. This is an important step. Rinse several times and make sure all water is out to allow beans to sprout. When they have sprouted for 2-3 days they are ready to eat. Always make sure your sprouts are completely dried out and store in fridge when you are done sprouting. See more bean experiments here. Back to Food Facts from Bean Facts.